I’ve certainly been in a number of sessions over the last three days, many of which I’ve blogged about here, but what have I learned? It’s been refreshing to immerse myself again in the IB world and its vast labyrinthe infrastructure which only becomes (frighteningly) apparent at times like these. It’s been good to catch up with some familiar colleagues, spend some intensive time with a colleague from my own school and meet some interesting new people. I’ve had an invitation to a primary school in Bangalore, seen a new and interesting looking anti-LMS called ‘teamie’ and have had the new iPad Shakespeare app demo’d for me by a super-keen Cambridge University Press man. I’ve taken the subway to Chinatown (*like every other system in the world the ticketing system is better than Melbournes) gone to the top of the tallest (twin) towers in the world and enjoyed performances from a range of talented students who’ve been featured every morning. I’ve been to some great workshops and some infuriating ones, have put my hand up to contribute only to be ignored for the keener student with the straighter hand at the front (oh yeah, that’s how that feels), have listened to some teachers and leaders who talk about themselves and their school but never their students and seen others who have made it their life work to change the world one conversation at a time. Taking up my pet topic of technology I’ve been heartened to see more conversations that ‘get it’, and less that talk about how kids ‘only play games and muck-around with computers’ and only a few outright annoying ‘Google is making us all stupid (except me)’ presentations, warm, nostalgic and comforting to much of the audience as they are, like a nice cup of Ovaltime in your pyjamas in front of the fire. There are problems with the IB; it’s huge Gormenghastian indifference, the transitional moments, the elitism, the dotpointing and the bureaucracy it serves, creates and fosters. But, at the heart of it, there’s also some compelling learning that’s possible within the structure, and some passionate people working in it. I fly home tomorrow, with only four days of the term left until Easter, and then back up this way to Vietnam for a holiday. I’ve been there before and was entranced. I hope to have some new learning there too. Below: Dr Paula Barrett talking about the importance of preventative work in mental health. Below: Cooling down in Chinatown. We’re doing an IB Five Year Review this year (though it’s not called that now) so I thought I should go to this session on what’s involved, and what’s changed, presented by Stephen Keegan, who did a great job, given the nature of this presentation and its emphasis on governance and regulations. Specific PD requirements to complete during the period. There are 76 practices listed for schools to cover and they emphasised that they’d thrown the review back on schools, ‘you are evaluating yourself, dynamically, over the full five years’. They argued that the self-study should take around a year and that there is room for celebration as well. The action plan lists objectives, actions, dates, whose responsible, budgetary implications and evidence. He suggested by starting with every practice as an objective, then starting from there. Not all need to be addressed in detail. Philosophy etc. might already have been dealt with, but Curriculum might need more attention. Lots of things are uploaded, especially policies. There needs to be Professional Development plan, a curriculum review cycle. New requirements here come into play in January 2014.It isn’t necessary to upload evidence in the form of certificates to prove staff went to the PD. Also, only one teacher in each subject (eg Language B) needs to attend the PD; they argued for a reasonable and common-sense approach. Next year the PD requirements will be stricter with a real emphasis on new teachers coming into a school having access to IB PD. There was some discussion about gathering evidence,who does it, and what it looks like. Student surveys should be done, he argued. Parent might also be involved, either with a survey or forum. Existing school documentation should be emphasised. Only the overview is submitted to the IBO now. This is an area where providing some more information about the nature of the school might be useful, especially if one review looks very different to the others. The course outline required is a course outline – “it doesn’t need to be Atlas Rubicon up in lights” on registration ,but there is a lot of interpretation around the require, not for “comprehensive” curriculum. They argued that some sample curriculum would help: a unit plan from maths, some formative assessment from History etc. they also suggested that passwords into systems like Atlas would be fine. Also, if you say you exceed the practice, then you should provide evidence. On another matter: first time I’ve seen PREZI used as a presentation tool too; nice transitions, but a big bunch of text on a slide isn’t really anything radically different from PowerPoint really and it was too small to read from the back of the room, even with my new 1.5 magnifiers! The premise of this panel worried me; that online learning has been characterised as what you do when classrooms aren’t possible (bird-flu!) Really? Okay, let’s be tolerant. It turned out to be an interesting session, if a little narrow definition of online, and I’d like a bit more about blended approaches. EG> Why are we talking off-line and online if they are mutually exclusive. Synchronous and asynchronous learning (German and Dutch offered to replace self-taught learning) using video conferencing primarily. What we’ve learned: pedagogy matters. Giving students access to subjects they can’t offer internally, but the world is changing. Challenging the notion that online courses are for a ‘certain kind of kid’. Thinking of making it mandatory for students to take up 1 course online and hoping that students will engage in an online experience that was so powerful it would leverage the more conventional bricks and mortars classes. They decided to offer one subject, ‘Economics’ as an online course only (and they had a good teacher on campus) They expected ‘push-back’ from parents and maybe teachers, but some has come from students. He describes the advantage of online: time and distance but also described the fact that MYP students had been circulating a petition asking that the Economics course be taught conventionally. Denise talked about ‘why bother’ and the four stages of online learning – substitution, augmentation, modification, redefinition. What is the desired outcome? she asked. Dennis made some provocative statements; ‘are schools that don’t offer online courses going to be swept away by those that do?’, should an online subject be compulsory for all students? Where is the IB heading? The IB is three years into a five year strategy, looking ahead to new directions especially regarding digital technologies. We were given a break-down of the kinds of new directions that the IB is looking at currently. I haven’t included notes here on the MYP or PYP programs specifically. The IB now has nearly 30000 students in an Alumni Network, helping with university recognition and research participation. Will stay as 10 attributes with revised descriptors and clarifying relation to international mindedness. Trying to make the Diploma teaching more focus and coherent, featuring best-practice pedagogy. New Global Politics subject. Increasing data showing higher results, completion etc in university for IB graduates. Moving from paper to digital. May 2013, 97% of scripts e-marked, with quality assurance through pre-marked random ‘seeding’. I haven’t been to the IB Asia Pacific Conference since I went to Invacargill in NZ in 2004. It was the bleakest, flattest, coldest place in the world; we walked the black ice to the conference in the morning and walked back in the dark at the end of the day. Besides the cold weather and the warm welcome of the locals I remember two things from that conference very strongly: the wooden dinghy in the hotel foyer filled with icy NZ beer, and the enthusiasm of the teachers for the IB curriculum. I’d only been to VCE conferences before, and they were characterised more by teeth-gnashing and more or less outright hostility than the (almost) universal positivity I encountered in NZ. But it wasn’t the cold that’s kept me away all these years. I don’t personally teach in the IB program and my role is around the teacher development, aligning the teaching and learning approaches to our VCE teaching, and having an understanding of where it’s all heading. Which leads me here this week,to Kuala Lumpur, a place that couldn’t be any more different to Invacargill if it tried. It should be an interesting few days, and I’ll be posting some of my session notes later on. 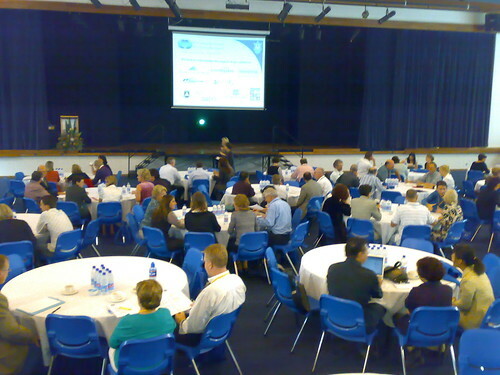 Just back from an IB conference in North Sydney. She posed the question to the IB about whether it can meet the challenge of the non-academic student. The next speaker was Malcolm Pritchard, the Principal of Kormilda College in Darwin, NT, a school that has a significant proportion of indigenous students from remote communities there as boarders. He began by saying, “We are a continent away from the comfortable north shore of Sydney” and he talked of his school and the IB program there. He said that his priority was to respect and recognise the learning of indigenous students, not to try to assimilate them. I was particularly struck by the differences in indigenous students that he spoke about, and particularly the way he described them as ‘salt-water people, fresh-water people and desert people’. Significantly, Malcolm also talked about the pressures placed upon schools like his by a sensationalist media. In the next session, Eva Cox spoke passionately about building intercultural understanding and the need for a more civil society. She spoke about the dangers of excluding the ‘other’. She argued that we should avoid becoming part of the homogeneous ‘blob’ of acceptance and keep alert and support dissent. I liked her quote that ‘compliance doesn’t create anything new’. She also argued that the IB should focus more on the kinds of students that the certificate produced, rather than just the final results. At this point one of the IB leaders immediately jumped to the defence of the IB and blamed schools for this emphasis on results and passing and failing but didn’t address the question from the audience about why it was necessary that students could ‘fail’ the IB Diploma. Mona Abdel-Fattah, Principal of the Sydney school in the Australian International Academy of Education, told us that this year it was 25 years of Islamic education in Australia and why her school had chosen IB. At one point she spoke about a ‘typical day’ in the life of a student at her school and referred to the way that Islam was portrayed in the media so constantly, and the effect that portrayal had on the young people she worked with. Ruby Holland, talked about how her school, St Paul’s Grammar School (Penrith), worked with the ethos of the IB. St Paul’s Grammar is also 25 years old this year and was the first p-12 IB school in NSW. She spoke about the way her school had worked at ‘democratising the IB’ and moving away from seeing the IB as only for elite students. She spoke of being a fairly rigorous faith-based school, which she described as looking for meaning outside the world and what that implied for how the school worked, and what they did. The ethos of the school centered around faith, hope, joy, humility, love, peace, truth, purity and justice. Everyone was ready for lunch by now and a sudden violent thunderstorm kept everyone inside, and had all the Victorians marvelling at this thing called rain! After lunch, I was particularly looking forward to hearing Professor Larissa Behrendt, (Law and Indigenous Studies, University of Technology, Sydney) talking about ‘After Sorry, What?’, mainly because I had read and written about her book Home, a novel focused around her own indigenous background and experiences. Behrendt’s presentation was earnest and forthright, but also repetitive, and just read out. She rarely looked at her audience and made not attempt to connect with them. Despite her obvious experience and research background, it seemed to me that she was almost hectoring her audience, a group of educators who were most likely in favour of her ideas. Behrendt said that for years Australia had been dominated by the politics of fear: fear of others, fear of economic insecurity and more. She then spoke of how important the ‘Sorry’ apology was for Australia, and what should happen now. She posed the question that many Australians asked: ‘How is that we spend so much money on indigenous issues and yet we don’t seem to be able to make a difference’. The answer is that much of the money tagged for indigenous funding doesn’t get there, with much going on admin. In fact, surprisingly, she argued that health funding for indigenous Australians may actually be under-funded by $400 million or more according to Access Economics. Behrendt was critical of the indigenous ‘intervention’ as embracing the ideologies of assimilation and mainstreaming rather than being founded on research as to what will actually work. She also criticised the punitive nature of linking welfare payments to school attendance as simply not working.